Apparently longevity runs in my family (at least on my Mom’s side). My Great Grandma lived into her late 90’s, as did her sisters. 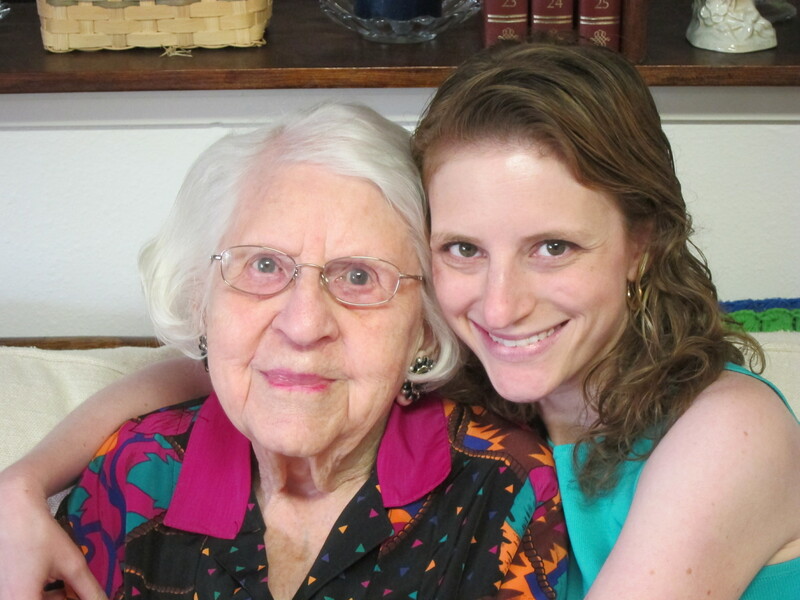 My Great Aunt Frieda lived to be 108. She was a child when railroads were expanding in Iowa. That is where my Grandma L grew up. In west central Iowa. I spent most of my childhood summers there on vacation. They are the type of leisurely days only a child can appreciate…walking to the library with my sister and returning with stacks of “Nancy Drew” and “Dana Girls Mystery Stories,” catching fireflies on balmy summer nights and playing cards while swiveling back and forth in a linoleum chair. I can still remember the cool, musty smell of the basement where my sister and I attempted to play nicely together. And always homemade rhubarb pie, local sweet corn, and other treats. So what does 100 years old look like? Grandma L is pretty adorable. She doesn’t like talking about her age, and she modestly informs us “I have no aches and pains.” She isn’t in a wheelchair. She has a walker, but if she has someone who will offer an arm, she can walk just fine. Her memory is also functioning pretty well. However, Grandma L doesn’t remember all the details anymore, and her frustration over the years that crept by is tangible. My family all gathered recently to celebrate Grandma L’s 100 years. I took the opportunity to talk with her about some of her memories and supplemented that with information my sister gathered several years back. I hoped, perhaps somewhat ambitiously, to have a few of her memories from each decade of her life, a historical timeline of sorts. In my own way, I wanted to travel through time with her. Education is important: My Grandma was the only girl with three brothers, growing up in rural Iowa during the Great Depression. Her parents insisted she finish high school. For her own children (my Mom and Uncle), it was always an expectation they would go to college. All of the four grandkids (of which I am one) are well educated. And so it will continue to be. Someone has to lead. It might as well be you: So it turns out my Grandma’s Mom was a bit of a trendstarter. The 1920’s, that rabel-rousing decade, saw women cutting their long locks as “the bob” came into fashion. 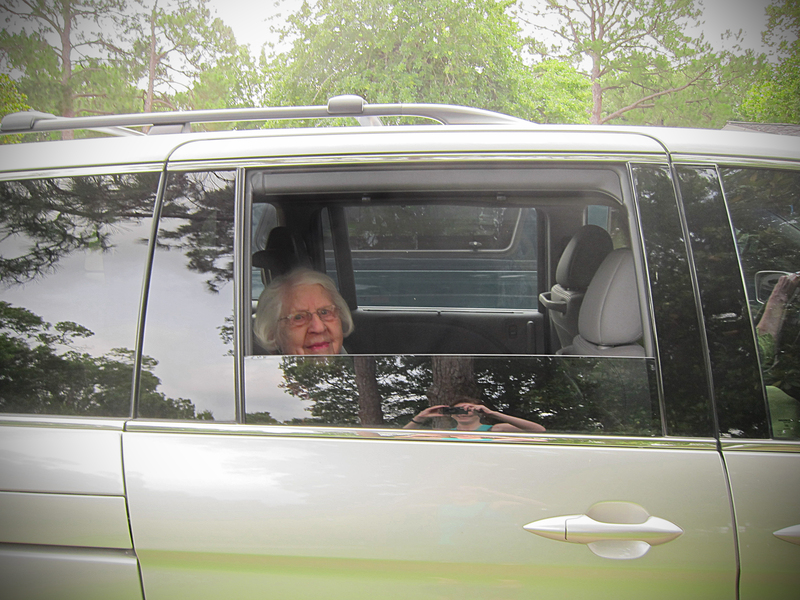 Great Grandma was the first in town to chop her locks and everyone else followed. She also started wearing shorter skirts and shoes with buttons. The rest of the local women followed suit. That makes me proud. It takes courage to be a leader, and I am inspired to know it is in my DNA. Music and the Arts are vital to the soul: Grandma L liked to dance. After all, the barn dances in the hayloft were a big deal when she was growing up. “Those floors were so slick” she says, remembering. During our conversation, she mentioned a few verses of a song she liked. A quick search on a nearby phone located Patsy Cline’s “Walkin’ After Midnight.” Grandma started bouncing her head as we played it for her. She would have been 47 when it first hit the airwaves. Grandma L never claimed to be musical, but listening and dancing were always a part of her life. I love feeling connected to her through this song and imagining her and my Grandpa dancing to it. Evolution becomes revolution: Grandma remembers that she was the 3rd in town to have TV. When I asked her if the transition from black and white to color was significant, she said “Not really. The colors weren’t nearly as bright as they are now.” However, in a rare moment of high level reflection on all of the social, political, and technological changes seen in her life, Grandma said “it has really been a revolution.” At a moment in time, the changes may seem, and actually be, incremental, but in time they become real progress, real revolution. It also occurred to me that she doesn’t get to choose what she can remember and what details are inaccessible. The present matters. At the end of your days, will you be able to remember today? And if you can’t pick and choose, the better you make each day, perhaps the higher the probability those days will be the ones you remember. I don’t claim to have any of these lessons, let alone this one, mastered. But I’m trying. As I traveled the world, I always sent Grandma L postcards. I ended each of them the same way. I’ll end this post similarly.